The Hausa people make up an ethnic group that represents over half of the population in Niger. These traditional communities are characterized by the strong habits and customs of families that carry on from generation to generation, such as their traditions in agriculture, small trading and migration. Among these traditions is one that sees education as unnecessary for young girls, and distracts them from supporting their families. Most girls from these communities pass their school years by, instead spending their time selling cakes or cola nuts in local markets and along roads. Making parents’ feelings about girls’ education even worse, the schools were in poor condition, with little to no teaching supplies in the empty classrooms. In communities like these, a sixth grade student may still not be able to read or write. It is in such a context that Sahiba, a 10-year-old girl, started to see major changes in her own life and in her community. Sahiba and friends at the reading club. 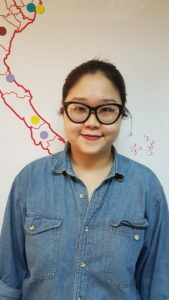 Born in a family of 16 members, her parents are barely able to afford food and clothing for all the children. The family’s only means for income is their harvest after the rainy season each year, so Sahiba and all her brothers and sisters count themselves lucky if they get two meals a day. Nothing about her home life predisposes Sahiba to perform well at school. Her father and mother are both illiterate. 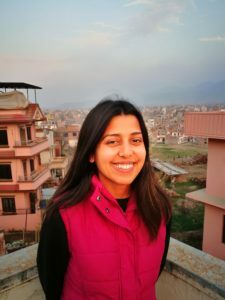 In spite of her parents’ aversion to educating their girls, Sahiba kept on going to school. But without any extra support, class was hard for her. After her first two years at primary school, she still felt very shy with her teachers and fellow students and did not participate in class. At 10, she could hardly read one-syllable words and was at the bottom of her class. In 2015, Save the Children representatives started to appear in their community, first hosting meetings for parents and teachers to discuss how education for their children could help their community in the long run. 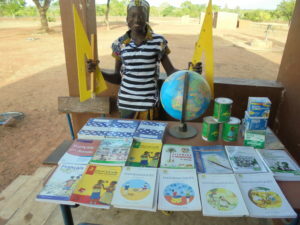 Next, the school environment started to improve, with new books, rulers and teaching guides for teachers. Where children used to sit on the dusty floor, they now had chairs to sit on. Brooms and soap were also been provided to keep the environment at the school clean and healthy. Classrooms were set-up to feel welcoming and inviting for children, and help keep them focused and engaged in their lessons. Then, so children had the opportunity to learn outside of school too, reading clubs were set-up in the community. The reading clubs not only provided plentiful books for a variety of reading levels, in particular for struggling readers, but they also allowed children to play games while learning. Guided by a Save the Children trained community volunteer, the clubs use songs, puzzles, word and spelling games to make the club a child-friendly space, that’s a little less formal than school. Sahiba’s teacher saw that she was a student who could benefit from the extra reading support from the reading clubs and suggested she start attending. Sahiba washing her hands at school. Just two years later, Sahiba is now in grade four and at the top of her class. Sahiba now dreams of becoming a teacher, to help other children in her community. Now that she can read and write, her confidence in herself has grown and she has new hopes for her future. Her mother and her father are all full of praise for Save the Children. They are seeing for themselves how education can open up big opportunities for their daughter, and how a new learning environment can really impact children’s ability to learn. 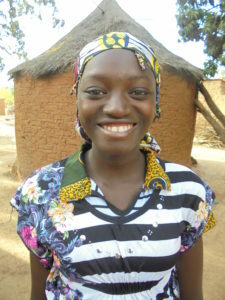 Thanks to sponsors, Save the Children in Niger is shifting attitudes about educating girls. In the Barragem community, in the Nacala area of Mozambique, lives the little Matano. He is 13 years old and in sixth grade. Though he had managed to learn to read and write at school, he had always struggled. He could read a little but not very well, and could not count properly. 13-year-old Matano lives in Barragem, in a rural part of Mozambique. When Save the Children started to train teachers in Barragem about how to foster their students’ confidence in the classroom, everything started to change. Before sponsorship came, teaching methods had always been focused on the teacher, without incorporating interaction from students into the lesson. Students like Matano did not feel encouraged to participate in the lessons themselves, and instead just sat quietly, often causing them to lose focus. 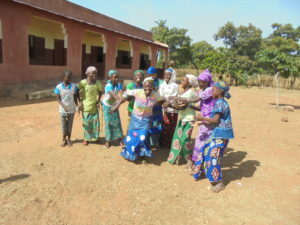 When Save the Children started teacher training in Barragem, teachers learned how to use student-focused activities, like games, puzzles and group work, to make lessons more fun. Teachers now know how to encourage students to keep trying even if they are having trouble, for example by giving praises after an answer is given even if it was not the correct one. With the dedication of his teacher and the personal commitment from the little Matano, his grades began to improve. As Matano improved, he came to inspire the other students in the class who had also been struggling. Matano was the winner of a reading and writing competition covering the whole district! Later that year, the district education offices organized a competition between all the schools in Nacala to honor the best students and help motivate children to work hard at practicing their reading and writing skills. Matano first won as the best student at his school, and then went on to win the district competition! Children were scored on their ability to pronounce words, read passages aloud and write words with correct spelling and sentence structure. 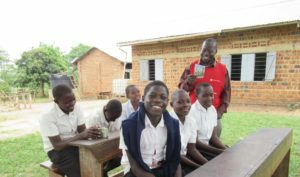 Now that sponsorship has helped show teachers a new way of engaging their students, Matano and his friends have big dreams. 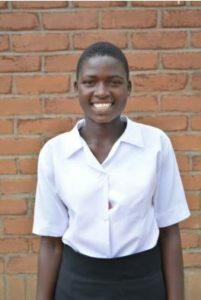 “I want to be a teacher so when I grow up, I can teach the children here in the community,” said Matano proudly. My name is Ramatoulaye and I am 12 years old. I am in fifth grade and love to read, and dream of becoming a teacher one day. I enjoy school and I get along with my schoolmates. I live with my family in a community that has been a part of Save the Children sponsorship programs since 2008. I had a difficult childhood because my parents divorced when I was very young. My stepmother raised my siblings and I. Being the youngest child, the absence of my mother affected me a lot. But, I was still lucky enough to attend school. Being in school and having many friends helps me to forget my mother’s absence. Our school wasn’t always as nice as it is today, though. Before Save the Children came, children were studying in poor conditions. The classrooms were made with straw and mud bricks, and would easily fall apart during harsh weather. The lessons taught in school were not fun for us either. Our teachers were not teachers by profession and had not had any real training in how to educate us. They didn’t know how to explain things in a way we would understand. Parents could hardly afford school supplies for their children anyway, and many of them did not see school as important. Our parents thought having us work on farms with crops or animals would be better for our families. So, school attendance was very low. These are some of the new teaching materials at my school. But since Save the Children came, sponsorship has been a true breath of fresh air. Our school has received school supplies that meet our needs as students but also make learning fun. We now have all kinds of new books, geometry tools, chalk and other teaching materials, and notebooks, writing slates, pens and pencils for me and my friends. The new classroom blocks are also strong and sturdy to survive the rainy season. They have big open doors and windows to keep it cool when it’s hot, with a shaded pathway for us to get out of the sun. The old building was dark and air didn’t move through it like this. Our teachers also learned how to make the lessons more interesting for us, and how to teach all of us, no matter how well we could read. Save the Children was even able to reduce our school fees by helping to find funding to support the teachers’ salaries, which many of our parents could not pay for. My friends and I playing in the school yard. Before we never had more than 15 students in my class. Now there are over 30! I’m happy I can go to school. I feel safe and welcome there. One day, maybe I can teach in a school like this. To learn more about how sponsors have changed the lives of children like Ramatoulaye, visit your online account at Sponsor.SavetheChildren.org/MyAccount. We have more videos and stories about the changes sponsors make possible there! In a small village in Zambia lives Bonaventure with his mother, father and eight siblings. At 10 years old, he is in his fifth grade. While most families around Bonaventure’s village depend on fishing and small-scale farming, his parents only grow a single crop, corn, to earn their living. Usually, they only have two meals a day because his parents cannot afford to feed him and his siblings three meals. Despite all this, Bonaventure considers himself fortunate because his home is located near a small health clinic. Other families must hike for over an hour or more in the hot sun, crossing streams and along bumpy roads, in order to reach their nearest health services. Before sponsorship, his school did not have safe drinking water or facilities for children to wash their hands during the day. Their old water source was a borehole, a type of well dug in the ground, that was old and rusty. There were no latrines specific for children, and the adult-sized latrines that were available had no handwashing facilities. Likewise, children didn’t know ways to help maintain their health, like by washing their hands. Thanks to sponsors, learning about how to stay healthy is easy (and fun!) for Bonaventure and his mom. 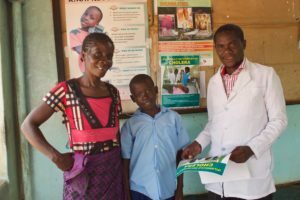 This increased the number of sick children in his village, which also delayed their learning, as children were often absent from school because they were too sick to attend. 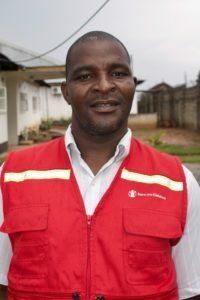 “We used to have such overwhelming cases of diarrhea in the past that sometimes we would completely run out of medical supplies,” shared Kasonde, the officer of the health clinic near Bonaventure’s home. Save the Children helped to organize a meeting with the community to discuss the problem. Parents, teachers and health and nutrition experts came together to discuss possible solutions. They decided to form a school health club that could focus on improving the health knowledge of the students and allow children to learn from each other. These club members were trained by Save the Children health and hygiene experts on how to help monitor the personal hygiene of their fellow pupils and younger students. For example, club members help manage handwashing facilities by ensuring children line up to take turns before returning to class after break or before having lunch. They also make sure that each handwashing area has soap and remains clean during the school day. Save the Children staff also supported school assemblies and handwashing demonstrations to teach children how to wash their hands properly. Learning materials like informational posters, illustrations and pictures with descriptive images were shared, to help show what good hygiene skills look like to students in a visual way. The school also now has new and clean latrines that are safe and easy for even young children to use. “I make sure I wash my hands all the time,” Bonaventure said proudly. “Thanks to Save the Children, we were given some chlorine which the village head and I used to chlorinate the wells around the village. [Diarrhea] cases have tremendously reduced,” says Kasonde happily. Bonaventure and his friends now enjoy using a clean latrine and drinking safe water during the school day. The handwashing facilities stationed at the corner of the school buildings are never short of water. 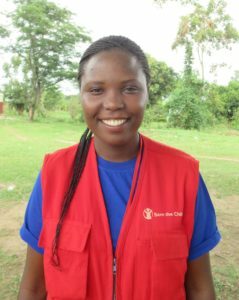 “I make sure I wash my hands all the time before eating and after using the latrine,” Bonaventure shared proudly. I’ve been supporting the child sponsorship program in Vietnam for about 6 months, working mostly on facilitating the letter writing relationship between our loyal sponsors and the children Save the Children supports in Vietnam. This February, for the first time, I went on a sponsor visit and saw with my own eyes that the love between sponsors and their sponsored children is much more than just the simple words in the letters they exchange. We went to see a 6-year-old boy named Thanh, attending his final year in a kindergarten in Bao Thang, Lao Cai. His school has been a part of sponsorship since 2014, and things have been changing a lot since then. Thanks to sponsors’ donations, reading corners have been created with a wide selection of books to choose from to boost children’s literacy and math skills, and many toys have been provided for both indoor and outdoor play, making the school more cheerful and welcoming for its young students. Before the school hardly had any toys or learning materials. Thanh’s family and his sponsors taking a photo together. We’ve learned through experience that planning sponsor visits with children Thanh’s age can be difficult, because they are too small to talk very much or too shy to express themselves in front of adults, let alone foreigner strangers. However, from the moment we were welcomed with hugs and kisses from the Italian sponsors, I knew that we would have a wonderful and memorable trip. Our sponsors were a couple, husband, Giuseppe who speaks English pretty well, and his wife, Fara, who spoke French in addition to Italian but not English. I prepared myself to help support the language barrier during our visit. Once we arrived at the school, we were greeted by a cheerful reception of children in colorful traditional clothes and gifts of beautiful handmade bracelets for each of us. We introduced ourselves to teachers and school staff, and explained the purpose of our visit to the crowd – to show Thanh’s sponsors what they were supporting through Save the Children in Bao Thang. Giuseppe and Fara also wanted to see how Thanh was doing and learn more about him than they ever could through their letter writing. The children showing off their bamboo dancing skills. Thanh himself at the beginning didn’t talk much, so we had to get acquainted with his grandparents first to help him open up. They showed us all the letters that had been exchanged between Thanh and Giuseppe, and slowly, Thanh began to recognize that this stranger before him was the very same one he had shared so many letters with. Not long after that, Thanh was happily being carried in the arms of Giuseppe as we continued to tour the school and meet with teachers. For fun, together we all made “chung cakes” – a type of sticky rice cake traditional of the Dao people, a culture prominent in this part of Vietnam – and “rom cakes” – a kind of stuffed sticky rice ball. 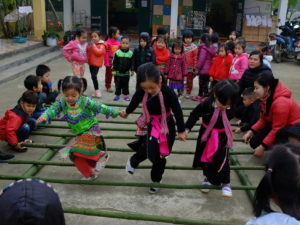 Children also performed the local traditional bamboo dance for the visitors. As the trip came to an end, we were all feeling comfortable and looking like good friends – myself and the other Save the Children staff with us; Thanh, with his family and his sponsors; and the teachers and other students that spent the day with us. Thanks to this opportunity, now I know that love can be transcended from just simple letter writing, and distance or different cultures means nothing when people care about each other. Did you know you could visit your sponsored child or the programs Save the Children helps support? Contact our team at ChildVisits@SaveChildren.org to learn how to plan a trip! “… and the three little pigs finally chased the tiger away. The end!” Bhone, a 4-year-old boy, wraps up reading the story he learned from school with his friends and cousins, and is ready to play another game on the playdate. Bhone is a preschooler living in Hpa An, in Kayin State in Myanmar, with his grandparents, aunty and two cousins. 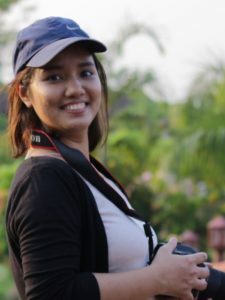 Bhone’s mother has been living in Bangkok as a migrant worker for over 10 years now. Just like other parents from this area who move to Thailand for work, she sends her earnings back to support her family. Hpa An is close to the Thailand border and jobs there tend to pay better than those in Hpa An, where the majority of opportunities are in low-paying farming or agriculture work. For this reason, many parents do the same to support their families, sending money to children and relatives in Myanmar. As a result of this migration, many families left in Hpa An are made up of young grandparents, or young uncles or aunts, who raise the children. 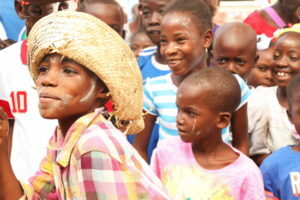 Before sponsors started supporting this community, little kids like Bhone played in the mud and dirt all day long. Most children did not have any games, toys or books of their own, in particular those that help with their learning skills. Play items were what was available to them – usually leaves or discarded plastics. Grandparents found it difficult to take care of children and used mobile phone games to keep them busy and distracted. Bhone and his aunty, Daw Zar, who benefit from sponsorship programs together. 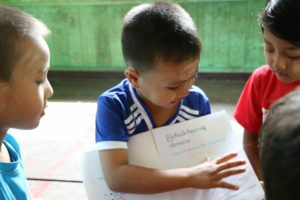 To help caretakers and give young children access to an engaging learning environment, in 2014 Save the Children started working with community members in Hpa An to establish early childhood learning centers. In addition to safe and reliable child care, these preschool programs provide children ages 3 – 5 years old with skills that prepare them for primary school, for example in early reading and math, which better sets them up for academic success as they get older. Bhone is the first of the children in his family to receive any kind of early childhood education, since these kinds of opportunities did not exist before. According to Bhone’s aunty Daw Zar, Bhone was a difficult boy before attending the preschool. He was stubborn, sometimes behaving violently with his aunt when she did not pay heed to his requests. He did not play much with his cousins either, but mostly kept to himself. As a part of opening the early childhood learning center in their community, Save the Children also messaged out information on child care techniques, and offered to train parents, grandparents and other caretakers like Bhone’s aunty Daw Zar on how to take care of their children in ways that nurtured their development, for example how to select nutritional food options. One key activity of these parenting education sessions was the promotion of a storytelling culture in children’s homes. Sponsorship presented the art of storytelling as a simple and beautiful way caretakers, and children, could share a memory, talk about their day, or read together from a book. Through Save the Children, caretakers learned how storytelling is one of the first language experiences for a child and thus has several advantages in stimulating their growth, such as exposing them to new vocabulary, improving their listening and comprehension skills and promoting creativity. It also creates and preserves culture and enhances family bonds, which in turn improves children’s self-esteem. Bhone storytelling during a playdate with his friends and cousins. Like all children at the early childhood learning center, story time is one of Bhone’s favorites at school. He has now become a good storyteller himself, remembering almost all of the stories he learns from his teacher and sometimes creating his own. “My favorite story is [about] a big bad tiger and three little pigs. I want to be smart like the three little pigs and make all the bad guys run away. Maybe I can be a police officer when I grow up” Bhone says excitedly. 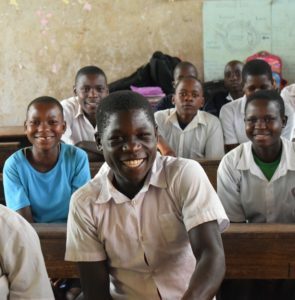 Although receiving a primary school education remains a basic public service in many countries across the world, for most children in Malawi, the chance to attend a good school is something very special, and millions of children in Malawi will never get the chance to experience this at all. My name is Margret. I live in Zomba, a rural area in Malawi, together with my parents and three siblings. I am 18 years old and in my first year of secondary school. I think of myself as one of the luckiest children in Malawi because I am in the sponsorship program. I joined sponsorship in 2008 when I was 8 years old. Before joining sponsorship, I didn’t have any exercise books or pens for school. Our school was always way too small for the number of students trying to go there. Sometimes, we could have 200 of us crammed into one room. When there wasn’t enough space, I remember we needed to have classes outside, and we used to be disturbed by the noisy people and cars on the road nearby. When we were inside, the classrooms were bare and dull, without any print rich materials on the walls or tools for the teachers to use like books and chalkboards. 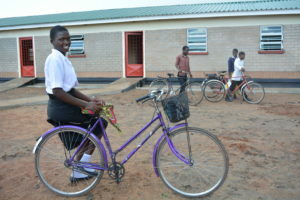 Margret on her bike ready to ride home from school. Then one day, sponsorship came and built a new school block. Now, there are enough classrooms for all of us! We still may have up to 60 students in a class, but this is much better than the hundreds trying to all learn together before. Classrooms are now stocked with textbooks and exercise books, and other learning materials like pens, pencils and chalk for the teachers. We also have the opportunity to participate in all kinds of afterschool activities. For example, we can learn about the arts or leadership skills through peer-to-peer sessions, so that we can learn with our friends. We never had these kinds of groups available to us before, and wouldn’t continue with our studies after school. Our teachers also know better how to make learning fun and interactive for the students, including for children with a diverse range of learning needs. This inspired me to go to school every day with hope. Margret sharing some laughter with a friend. The new school blocks also have toilets that make both boys and girls comfortable, and clean water spouts. This is especially important for the girls, because without bathrooms stocked with the materials we need we would feel embarrassed or even have to miss class during our time of the month. One of my favorite things in sponsorship is receiving cards from my sponsor. It makes me feel really special because it shows me my sponsor remembers me. Normally, even teenagers my age are not able to read and write as well as I am able to now, because of the changes sponsorship has made in my school. Because I had such a strong start in school, I feel much more confident to face the future and become a teacher one day. The idea of children’s rights is quite utopian to a child’s mind, but when summarized and explained in a way children can understand, it becomes more tangible. 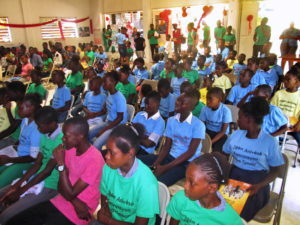 Being conscious about this, the sponsorship team in Haiti met with governmental groups such as the Dessalines City Hall, departments related to social well-being and other local partners. Our goal was to have children’s participation in celebrating Universal Children’s Day last November, and help them reflect on their rights as children. We wanted to do something special where the children themselves would be the promoters of their rights within the community. Involving local groups and stakeholders was important too, in order to ensure community members feel an ownership of the programs we help start for children, and to prepare them to manage activities on their own one day and ensure sustainability of our work. Children advocating for their rights as children on Universal Children’s Day. The children prepared for weeks for the celebration. With their friends, they learned about children’s rights at school, engaged in group discussions and shared stories and drawings that helped them reflect on what their rights are. For example, what education did they have a right to as children? They came to see that they not only had the right to attend a good school, but also the right to eat healthy meals, to play and enjoy their time as children, to not fear physical punishment or abuse, and the right to grow up in a clean environment. Over 70 schools and 12 youth clubs participated. During the grand celebration, students presented their thoughts, through drawings, posters and creative writing, with the support of Save the Children staff. Davidson, a 9-year-old fourth grade student, was one eager participant. He found himself inspired by a little girl from his neighborhood who worked as a restavèk, a child domestic worker who goes to school in the afternoon, only after the day’s work is finished. He said until learning about children’s rights, he thought it was normal for her to be in that position, since she was orphan. Children dancing during Universal Children’s Day celebrations. By advocating for children’s rights like access to school and health services, sponsorship is helping to raise awareness and shift local cultures to see these kinds of traditional practices as harmful to society. 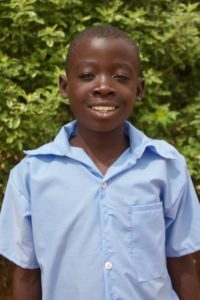 Dessalines is really grateful for sponsors like you because many children like Davidson now know their rights as a child and will advocate to help parents, teachers and other community members to respect them. Today, they know that they can be anything they want when they grow up, thanks to your continuous support! What is your understanding of children’s rights? How are they different from the rights of adults? How do they need extra protection? Visit SavetheChildren.org today to learn more about how you can help us advocate for the rights of children! A couple of months back I was visiting the schools of Ganeshpur, one of the many communities in Kapilvastu district, where Save the Children works in Nepal. In their small village, most live in extreme poverty, earning their living by farming but struggling to make enough to support their families. I had the opportunity to meet a young boy, Nar Hari, 16 year old and in eleventh grade, follow him to his school and learn from him how Save the Children’s sponsorship program was helping him and his friends. I learned this was not only through school, but through many other ways that he and the others hadn’t thought possible. Since 2009, Save the Children’s sponsorship program has worked with communities in Kapilvastu to create safe and healthy environments in schools and at homes for children so they can learn and grow like every other child. Nar Hari posing in front of the wall magazine he created with the child club. He had learned through sponsorship and Kalika staff visiting his school that there was a new opportunity where he would be able to learn with his friends and develop important leadership and life skills, like those related to health and hygiene, at club with his friends outside of school. He decided to join. At the Save the Children supported child clubs, students can learn about how to wash their hands and why handwashing is so important to help prevent the spread of diseases. Before Save the Children started health programs like the child club, children would not wash their hands before eating or would only use water with no soap, making them sick all the time. Nar Hari also told me about how he and his fellow students started interacting with teachers in class more often after Kalika and Save the Children started coming. When he was younger, corporal punishment was still used in the classroom, and generally teachers always seemed angry with them. Today, teachers have learned how to be more patient with their students, and how to set a more kind and welcome tone in the classroom. This is due to teacher trainings offered through sponsorship, that show teachers new child-friendly methods to create engaging and active lessons in class, that don’t feel intimidating or put too much pressure on students. Now everyone is healthier, and children both can and want to come to school more. After learning those first important lessons, Nar Hari and his friends set to work to continue spreading these important health messages to other children and families in their community. 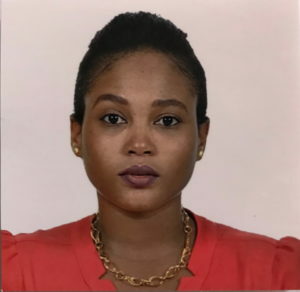 They decided to write a play that would make people understand how bad hygiene and sanitation practices could lead to many diseases – diseases that could spread between people and even to other food items in their households. Nar Hari working on a school science project with friends. 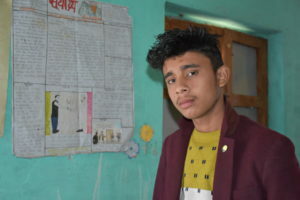 He and his friends also created a wall magazine to spread more useful messages to their peers, a kind of periodical run on a notice board with articles, drawings, poems and other creative writing from Nar Hari and his fellow club members. With a little support from Save the Children, Nar Hari’s child club and many others in Nepal are working hard to cascade good health practices from one home to the next. They also recently were able to show local families how to construct toilets using whatever local resources are available, whereas before there were hardly any toilets near homes or in the community. Nar Hari attributes the skills he has developed as a young adult to his involvement in the child club. “Conversing with people, differentiating right from wrong and being able to discuss in front of other people as well – this is what Save the Children gave me,” he says. Child clubs are formed for children ages 10 – 18 to come together to learn about children’s rights, health and personal hygiene, and develop important life skills like how to be a good leader. Many thanks to our sponsors, all the way from Nepal!